A continuation of last week’s comprehensive look at recent releases that travels all over the world. Two hours of nothing but female-led rock and roll. The death of Ramones drummer Tommy Ramone inspires this tribute to the legendary band and musician. Tonight’s show features an interview with Centro-Matic leader Will Johnson, along with plenty of brand new releases! Inspired by a Lydia Loveless song called “Steve Earle”, tonight’s show is nothing but songs about other artists. For the third straight year, host Scott Hudson compiled two hours of the scariest songs ever! Play this when the trick or treaters come to your door. 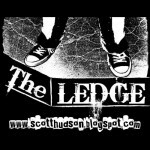 The longest day of the year has inspired the longest Ledge show – 44 tracks of summer-related tunes! After two themed shows, the new releases and blog finds piled up. Tonight we unload tons of brand new music! Scott spends two hours figuring out how to spend his half-billion dollar lottery proceeds!